Further to my last Post where I looked at some Military style models. I mentioned in passing the Nixon Unit 40 which I thought might be a consideration IF the digits and dial contrast was readable in all light situations. I liked the fact it was a 40mm diameter model as this would fit the smaller wrist comfortably, but I still have reservations on that display. However I also spotted the relatively new Dixon Baha which is a varient of the Nixon SS and 40 series, specially outfitted for the outdoor enthusiast, so I though I’d better check it out. I have to say right away that I do like the look of it, though somewhat disappointed by the physical size of this model – at 50mm diameter it is one BIG watch! However there is a trade off in that one of the added functions over the SS or 40 series is the inclusion of a Digital Compass. It also has an LED flashlight at the lower left of the dial, which is a surprisingly useful gadget. The other main difference is the strap which is a heavy duty nylon & velcro fast wrap strap, a type I’ve always liked as it’s so easy to use and usually very comfortable. I’m also informed that this model has an increased contrast digital dial array, and that does interest me as this was my major concern on the previous models, so it may be that my concern could be solved, though I would still have to see one on my wrist to tell. The complete function set as follows – positive or negative digital (high contrast stated on the spec), Time of Day (12 hour or 24 hour), Seconds, Day/Date, Calendar range from 2005-2105, Dual time, Alarm, Chronograph, Timer and Thermometer with an external sensor (in Fahrenheit or Celsius), LED flashlight and Compass. The case is polycarbonate which is as tough as anything and the stainless pushers are well shrouded to prevent damage. A domed hardened mineral crystal, 100m Water Resistance and a brushed stainless steel case back. 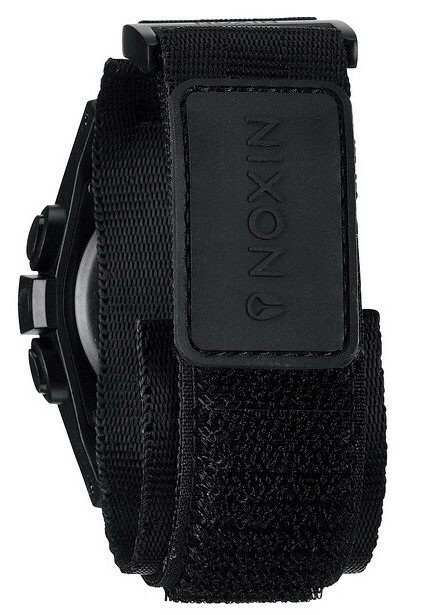 The strap is 24mm wide on a 32mm wrist cuff held with stainless steel screw pins and it has a solid stainless steel roll bar buckle, so very outdoorsy, all of which I like. The Compass is the type that points to the arrow @12 on the molded fixed bezel and gives you the bearing angle in degrees (in 1° segments) on the main dial area and on the upper display area it gives the Cardinal direction NNW, ENE and so on. The compass also has a declination setting so you can set for your area and there is a Compass calibration sequence similar to most of these digital compass models. Note that it’s not the most accurate of compasses at +/- 10° but it’s useful and in practice is perhaps more accurate than the error allowance would indicate. I have other compass models that are quoted with error allowances of around +/- 5° and generally manage around 2° offset at most in actual use, so I would expect somewhere in the same range. The LED flashlight is a great idea and very similar to those tiny little plastic push button jobs you might have on your keyring – it’s just bright enough and perfect for those times looking through your bag or trying to get your key in the lock at night – very useful and a neat addition (it’s not trying to be a military signal light or anything like that) and I like it. So on the face of it this appears to be another digital model that might well meet the “military” style criteria as case and function wise it looks pretty good. And the strap looks good and overall the watch should be as tough as old boots. Also the addition of the Compass and flashlight is a real bonus. But – I have reservations ? 1) IS the digital legibility, high contrast or whatever, good enough to be easily seen? 2) IS this model just too big at 50mm diameter, for my 170mm wrist? 3) IS the strap long enough (I have heard reports)? 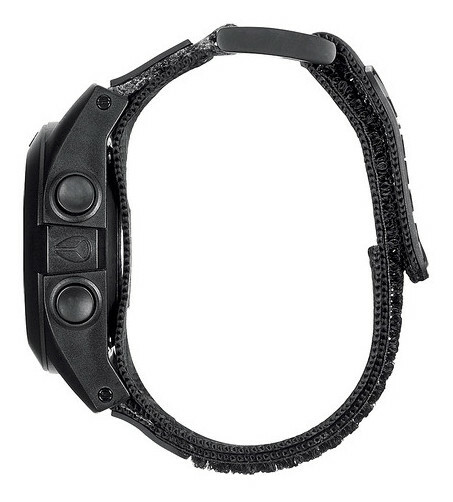 Though not a deal breaker as the strap can be easily changed. If my reservation questions are answered satisfactorily and I can wear it without looking like a complete lemon – it has to be a consideration. 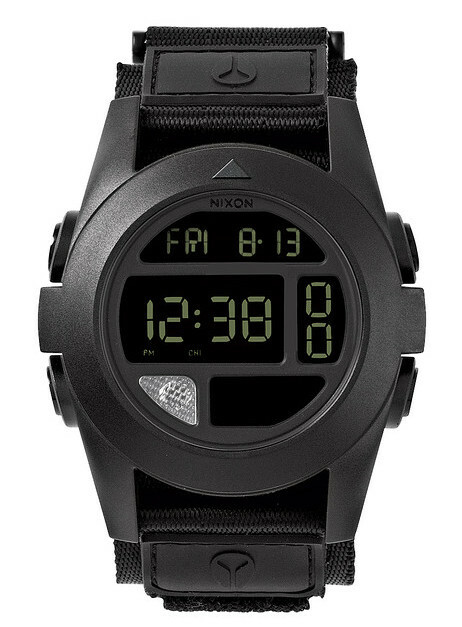 So a visit to a Nixon Dealer is the only option and then we’ll see (or not if the digits are faint!). The price is around £125 in the UK. Note – The difficulty of choosing a military style watch is compounded by the fact that there are many “divers” models out there that are tough, highly Water Resistant, great readability day and night and very tough indeed, as long as you avoid the highly colored strap or dial, they too are an option worth considering. Just makes the task that much more difficult. Ah well . . . . This entry was posted in Spotlight and tagged Compass watch, LED flashlight, Nixon Baha. Bookmark the permalink. Good blog you have here… one question regarding compass watches accuracy: ¿Which models you have with “+/- 5°” error allowance? I had a Casio PAW2000 and manual said +-15 degrees, but I detected bigger errors. In fact the compass function was nearly useless, only usefull for a general direction. I ended buying a Suunto clipper compass because of that. Hi, I have around 20 different types and styles of watch compass and most of the models tend to quote the same – + or – 15º. Few state better accuracy as the variables of position, physical influences and so on are so great, that saying anything else would be open to all sorts of accusations. The key to best accuracy is always “calibration” even with basic twin sensor models. Accuracy is usually (but not always) bettered by Triple Sensor models. It IS however essential before use in any location to calibrate as best you can (and even then the instructions can sometimes be confusing to say the least). Ask today’s experienced climber/walker if he relies on his compass watch – in answer most will simply point to their old style compass on the end of their knife or hanging from their belt. They use it basically for confirmation as trust is still an issue with the watch. So most do not rely solely on a watch compass. Suunto at first glance seem to claim better accuracy, though I have a couple of Casios that match and even surpass the Suunto. BUT it is very dependent on the particular watch. I have a few of the same make, same modules and same sensors and they differ widely. Out of the 20 odd watches I have, I use only 3 that I regard as accurate enough for my needs. These are easy to use, easy to calibrate and see in daylight (unlike most Suuntos I have used). So basically it’s a matter of luck – you may get a good one or you might not. In either event I carry a GPS and a manual old style military oil filled compass AND a decent map, as a norm!